We provide a 24/7 facility where you can come and train at our gym at a time that suits you. ​Route 2 Fitness provide a range of equipment to help you reach your goals whether its upstairs in the cardio area or downstairs in the weight room. Finger print access means you can enter the facility any time of day (this includes bank holidays). CCTV cameras are used at Route 2 Fitness for insurance purposes. 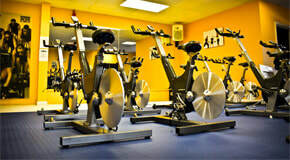 Ride our state of the art cycling machines in our RPM classes or go it alone. Wind Down after a heavy workout in one of our saunas.